I thought a series on common Indian household herbs and spices would be fun, things that are used in day to day cooking and how they are good for you. You will also find new ideas and tips to use them in your own kitchens. The series starts with coriander or cilantro. The open air markets or bazaars of India are a treat to the five senses. Even modern cities like Bombay, have one such market in each locality and almost all kinds of fresh vegetables, fruits and herbs are sold there. One walk through such a market and the smell that hits you first, is the pungently sweet aroma of fresh coriander. This is one herb that is easily the most popular one in India. It is used as a garnish in almost every savoury or spicy dish in Indian cuisine to add a unique freshness. Coriander or cilantro as it is known in several parts of the world is the world's oldest known herb. It has been used as early as 5000 BC. The seeds of this plant are a main ingredient in curry powders and garam masala – the Indian mixed spice powder. The seeds when powdered lend the uniquely Indian taste to most gravies and curries without adding any heat. This herb is also widely used in Asian, Caribbean and Mexican cuisines. This herb invokes mixed reactions from people. Those who are used to it for centuries love its strong aroma and feel their food to be incomplete without a sprinkling of this green wonder. Others who haven't yet got used it, find the smell overwhelming and at times, repulsive. So much so, that there are 'I hate cilantro' clubs. There are theories to propose that genetics has a role to play in a person's like/dislike for coriander. My genes surely dictate that I have an undying love for this fragrant wonder. Fresh coriander is awailable in most supermarkets as well ethnic stores. Buying from an ethnic store will ensure fresher produce because of faster turnovers. To store fresh coriander, cut off the thick stems. Store the leaves and delicate stems in an airtight box in the fridge. Coriander stored this way will stay fresh for 4-5 days. Take the required quantity befor use and wash it with plenty of water. Drain, pat dry and chop it as per need. The seeds being brittle can be easily powdered with a pestle after slight roasting. It is better to powder the seeds as and when required as the readymade powder doesn't retain its freshness for very long. Coriander is rich in iron, magnesium, manganese and dietary fiber. Researchers have isolated a compound from coriander that is twice as effective as an antibiotic that works against salmonella. 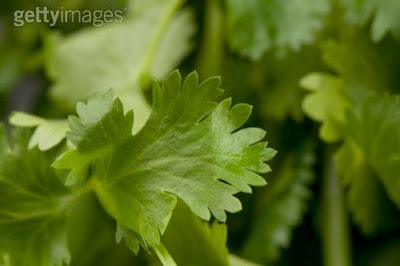 This proves that coriander is a natural anti-bacterial agent and its liberal use in salads and salsa is well justified. The phenols and flavonoids present in coriander are known to fight allergies. Ayurveda, the ancient medical science also regards this herb as an excellent natural remedy for enhancing digestion. It also alleviates problems like flatulence, bloating and loss of appetite. Coriander is also an effective detoxifying agent. Children under age two, can be given a weak coriander tea to relieve them of colicky pains. Coriander oil rubbed on joints is known to relieve arthritic pains. This is a popular Indian digestive drink. It is also had as an appetiser before meals. This chhaas is low in calories, yet rich in taste. Put all the ingredients together in a blender and spin for 30 seconds until all the ingredients come together. This recipe can easily be doubled / multiplied to fill a pitcher. Serve chilled in hot seasons. Make it with water at room temperature for the winters. If you like it spicier, add a finely chopped Asian / Indian green chilli to the ingredients. This is one chutney that is stocked in most Indian kitchens to use as a spread in sandwiches or as an accompaniment for most snacks like kabobs and samosas. 1. Put all the ingredients except the lemon juice in a coffee grinder / chutney jar of a Sumeet grinder. 2. Add a few tbsp of water to grind to a very smooth paste. 3. Remove in a jar / bowl and squeeze the lemon juice on the top. This retains the fresh green colour. Check for salt. This will stay for 3-4 days when stored in an air-tight jar in the refrigerator. Use this chutney as a marinade for fish or chicken before grilling them, for an Indian style grilled fish / chicken. You can also try this as a spread for Pizzas. Chutney thinned with buttermilk can be used as a dressing for salads. 1.Mix finely chopped coriander in the egg mixture for preparing scrambled eggs or omelettes to add a burst of flavour and colour. 3.A bunch of coriander added to the hummus ingredients gives a twist to the regular hummus. 4.Coriander seeds and stems can be boiled along with vegetables or chicken to make a flavourful broth. I really love coriander! I made a coriander chutney (without the peanuts) similar to yours here. It was just wonderful. Refreshing in every way. I remember my mum used to spread this on bread and make sandwiches out of this for us to snack on. UMMMM! I love coriander in all forms, too. Such a striking taste that goes with just about anything. Mmmmmmm. This will be a great series for me--with my parents about to move to Bangalore the subject of Indian cooking is big right now in the house. I've never had anything but the most basic curry too, so I have much to learn. Chemicals in Food - How to Avoid Them?